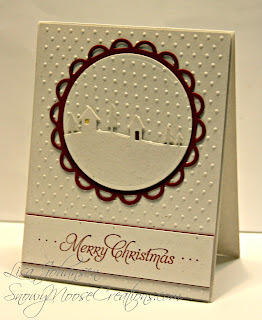 I got some stamping time in today in order to get the Merry Monday challenge done before it closes! I've been thinking about this sketch all week and what I wanted to do. I bought this die from Memory Box right before Christmas and this is my first time using it. I've seen it on quite a few blogs and just love the simplicity of it. This card was so hard to photograph.Being an (almost) all white card didn't help, and then add to the fact that its cloudy and the sun sets at 4:30pm and well, the lighting sucked. Its a very pretty and striking card in person. I used Cherry Cobbler as an accent color and the only other color on the card is some Daffodil Delight in the house window. The sentiment was stamped in Cherry Cobbler and that piece was also backed with Cherry Cobbler card stock. 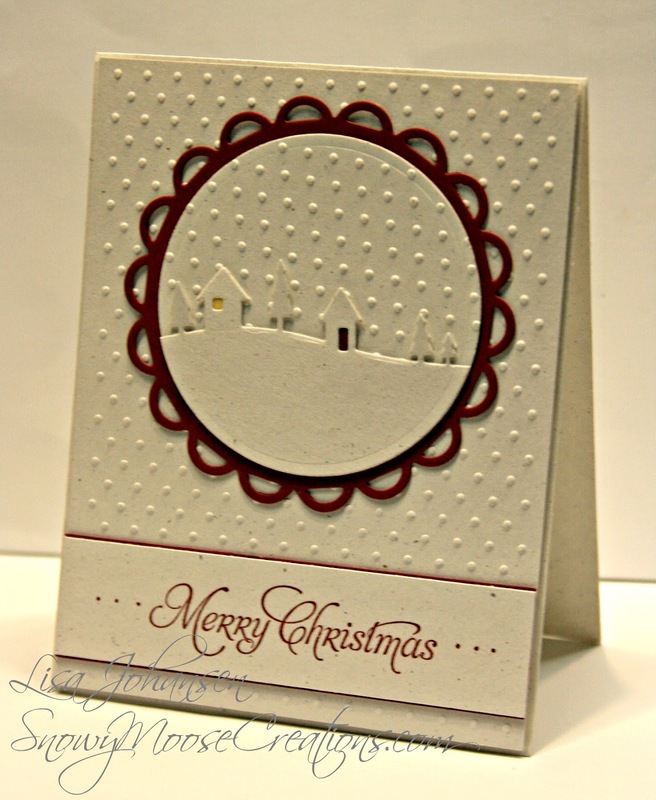 I used the Cuttlebug Swiss Dots embossing folder to create my background. Its my favorite folder to use to create a falling snow effect. I originally added Dazzling Details to the landscape scene but the glitter actually detracted from the serenity of the card so I cut another piece, removed the glitter covered one and put a clean one back on. Beautiful card. Love the CAS lines. Thanks for joining us at Merry Monday. 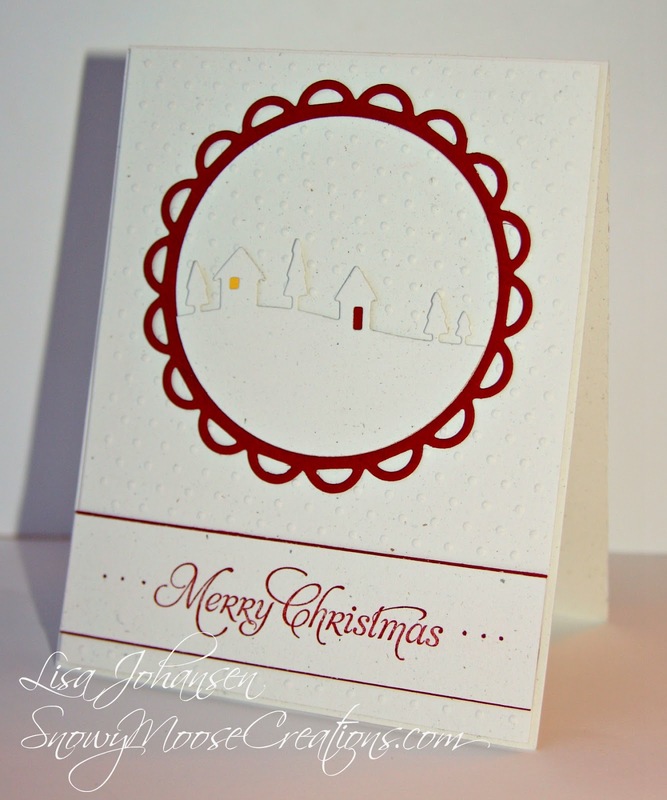 Beautiful card, Lisa! Love the little village and the overall simplicity! So very pretty! This turned out absolutely wonderful! I just bought that die but haven't used it yet. Now you make me want to pull it out and use it. Thanks for joining us this week at Merry Monday. Gorgeous! The embossing does look like snow: so pretty! What a sweet card! Love it. Yes! I love this die too and you have used it so well Lisa! The embossed snow is fab! Thanks for joining us at Merry Monday! 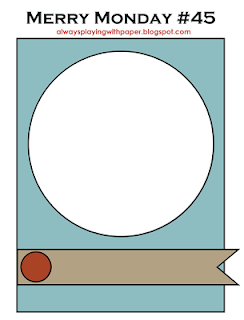 Wonderful card, I love all the fantastic texture. Thank you for joining us for Merry Monday this week. This is so pretty with all the white and the snow falling! Cherry Cobbler is a perfect accent color and I love the "light" in the windows! Thanks for sharing with us at Merry Monday, Lisa!